Just like buying two different beds, just flip it over for a new look. 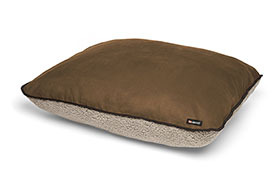 Choose plush Berber Fleece side when it's cold and use the Faux Suede side when the weather turns warm. Removable, zippered cover for cleaning. The zippered inner liner is made of water resistant rip-stop nylon. Filled with 100% recyled polyfiber fill, Smartfill (Big Shrimpy's fiber-fill, more substantial than other brands, easy to refluff).